Banh mi, like Pho, is the most exported Vietnamese specialty. Banh mi means bread but actually it refers to baguette sandwich filled with a variety of different things. 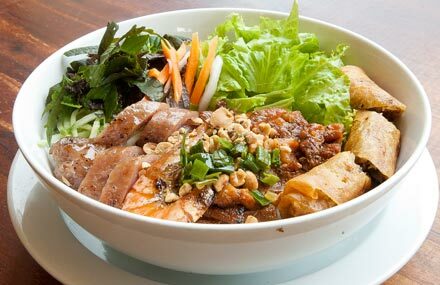 Banh mi is easily found on every street on Vietnam, yet banh mi Saigon has unique flavors that allure many food lovers. 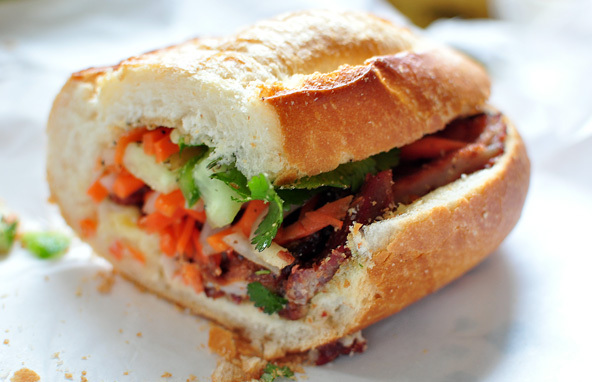 There are many different varieties of banh mi but the basic sandwich starts with a crusty baguette that’s sliced in half and stuffed with layers of pork, luncheon meats, shredded cured pork skin, pâté, mayonnaise, Vietnamese radish and carrot pickles, a handful of sliced cucumbers, sprigs of coriander (cilantro), and last but not least, an optional, yet in my opinion necessary, scoop of fresh pounded chilies. Pho, of course, is a must. 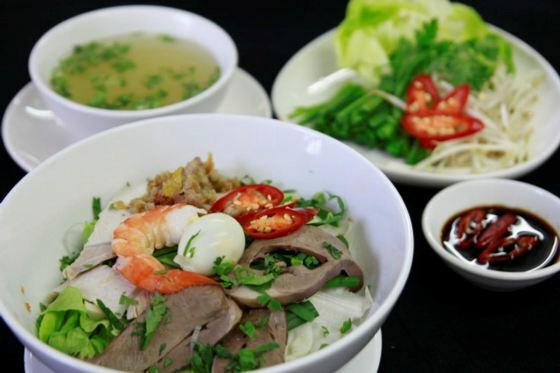 Pho is the combination of soft rice noodles in a soup broth, normally prepared with either bo (beef) or ga (chicken). However, the flavor of soup broth is different with the soup in the North Vietnam. The soup broth is cooked with more type of herbs and a bit sweet. Pho in Saigon is also served with a plate of fresh herbs, typically including bean sprout, mint, and Vietnamese coriander. There are many types of bun, bun rieu, bun mam, bun bo Nam Bo... Bun, rice vermicelli, is combined with different things to make different dishes. Bun rieu is a Vietnamese crab based soup noodle dish. 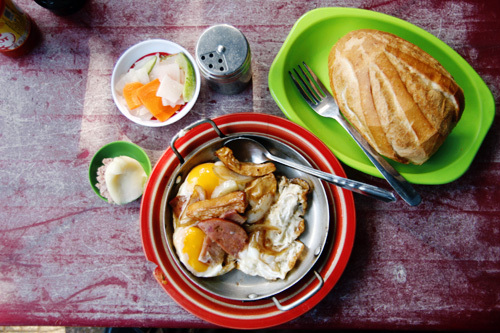 Bun mam is typically a southern Vietnamese dish. 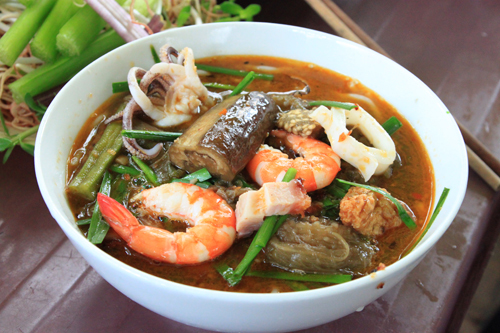 The base of any bowl of bun mam (bún mắm) is a dark colored broth prepared with fermented fish sauce. The fermented fish sauce gives the soup broth a well rounded, balanced flavor, and it’s honestly not nearly as fishy as it might sound or smell. Hu tieu (pronounced "hoo tee-u") signals a Chinese-Southeast Asian style noodle soup made with a pork bone broth and no fish sauce. But that's where simplicity ends. The noodles in a bowl of hu tieu can be chewy clear tapioca noodles, opaque white rice noodles like you'd use for pho noodle soup, or thin Chinese egg noodles (mi). The toppings cover a wide territory, and may include boneless pork, pork ribs, pork offal, shrimp, squid, wonton dumplings, fried garlic, fried shallot, and/or scallion. As usual, you pick and choose whatever you want. The dish normally begins with a handful of chopped up herbs and lettuce at the bottom of a bowl, then in goes fresh rice vermicelli noodles then a few skewers of grilled pork are layered on that, and finally a sweet and salty fish sauce, and a scoop of oily chives and green onions, and pickles are all added on top. Sort of like a crepe, a Vietnamese banh xeo is a crispy savory snack that’s a favorite for many. 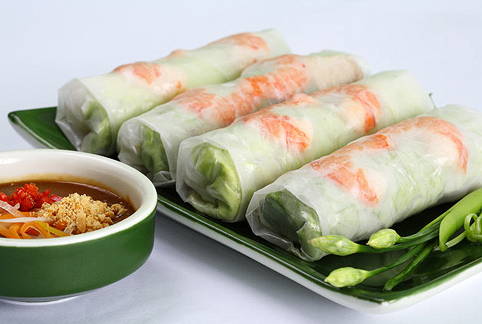 Goi cuon, summer rolls, are made with rice paper, known as banh trang, that’s slightly moistened, then filled with, typically a mixture of rice vermicelli noodles, pieces of pork, shrimp, and then stuffed with leaves and herbs like basil and lettuce before being wrapped. Cha gio are Vietnamese deep fried spring rolls, a combination of mung bean noodles, minced pork, and sometimes crab if you can find them, mixed with a subtle blend of salty spices, wrapped in rice paper, and then deep fried to a crisp. Cơm tấm sườn nướng is the broken rice and a thin grilled pork chop, served on a plate and accompanied by fish sauce dressing, cucumber pickles, green onion oil, and chilies to garnish. Trung Nguyen is the largest coffee chain in Vietnam, with over 1,000 cafes in the country. When in HCMC, you can’t go too long without stumbling across a branch. Despite being a chain, their coffee is excellent, with a variety of beans produced by sustainable methods, with full descriptions and differing flavour profiles available. The cafes are very modern and nicely fit out, and free WiFi is available (I was surprised at the extent to which free WiFi is available in cafes in HCMC). Menus are in English and most of the staff speak basic English. 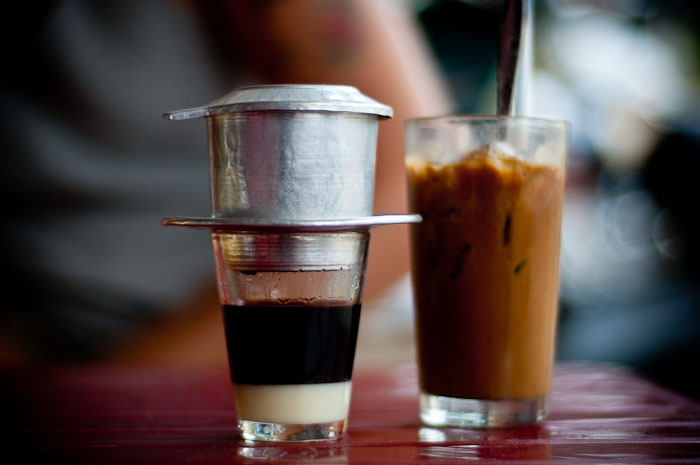 There are a variety of options available, but I always went for the traditional Vietnamese coffee. When your coffee arrives, it has just begun the process of filtering. The ground beans are in the bottom compartment of the silver filter, with filter holes above, for the hot water to drip through, and filter holes below, for the coffee to drip into the cup. A few minutes later, the filtration process is complete. If you asked for your coffee with condensed milk, it is put into the coffee cup at the start. Next, you pour the coffee into your cup of ice, then stir and enjoy. Traditional Vietnamese coffee is a very tasty, refreshing way of drinking coffee and I was hooked on it during my time in Vietnam. You can choose whether you want condensed milk or not, and whether you want it hot or cold.